While you are busy making and scoffing this down, be sure to subscribe to this blog for more great “Aha Moment” recipes, as well and generally enriching posts on the things that matter most in life, as well as the fun stuff, and just because good content is hard to find these days. What a run-on sentence! Shameless plug aside (I need the support guys)…. OK… really aside. This recipe is just WICKEDLY_______. Insert all the superlatives for ‘mouthwateringly,’ scrumptious, moreish, orgasmic food that was just too darn easy to make! Yes I did just type “orgasmic” in a two-ingredient dish that includes cauliflower. No I am not exaggerating, not even a teeny-weeny bit. This is perfect for EVERY diet and it is even almost vegan! How about a one-size-fits-all food loving slam dunk! 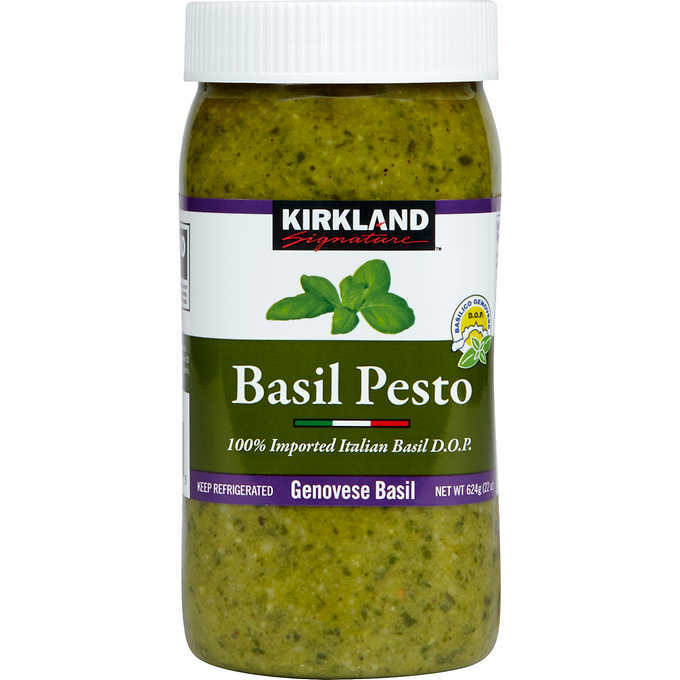 Let me quickly add a disclaimer of not actually liking store-bought pesto. I prefer generally to make my own. However, when I saw the jar in the refrigerator of PriceSmart Aruba during my last visit, I decided to try it out. At the bare minimum for a quick variation from the regular pomodoro (tomato sauce) for little bub’s pasta. And that is how I stumbled onto this amazing discovery. When I reached home and opened the jar with the intention of making him a pesto pasta and something else for me (since I am limiting my carbs), I was gobsmacked. I had to grab another spoon and taste again. The darn thing was authentic and mind-blowingly scrumptious! I was in danger of putting on a huge pot of pasta for myslef… and then it hit me. Try the cauliflower. And voila! I actually tasted bub’s pasta with pesto (an this was great quality Italian-made pasta) and I actually preferred the cauliflower! Ka-pow! Pasta who? 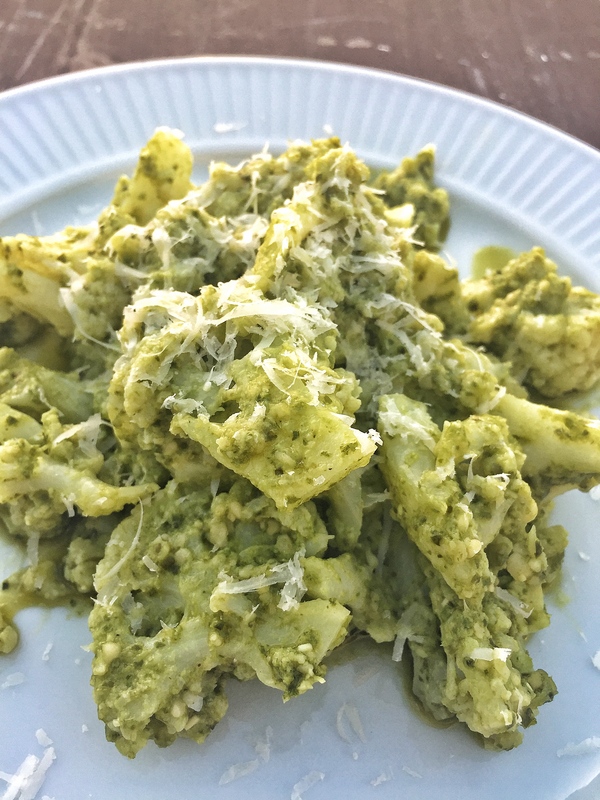 Seriously, it is the quality of the pesto that makes this Cauliflower Pesto Pasta dish. It is made from 100% Genovese basil from Italy, extra virgin olive oil and Italian sheep’s milk pecorino romano cheese as well as pine nuts. As we have been saying on this blog over the last 8 years, ingredients are EVERYTHING! Move over Pasta! This is the best fake pasta dish ever. So good you will soon forget how to spell "pasta." Perfect for the waist, a keto, lowcarb, paleo and gluten free recipe. Recipe yields 1 serving. If you like this recipe, share it on your social media and share it also with others. It is also a diabetic -friendly recipe and it just might be the recipe to get kids to consider cauliflower tasty. This is great as a main or as a side with grilled chicken, steak or seafood. 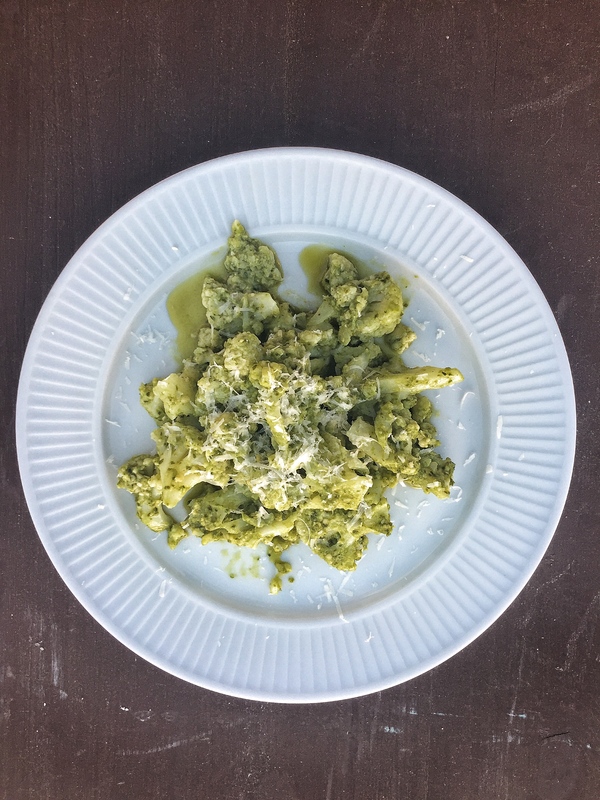 Why have I never added pesto to cauliflower? This is my two favorite things in the world! Wow! 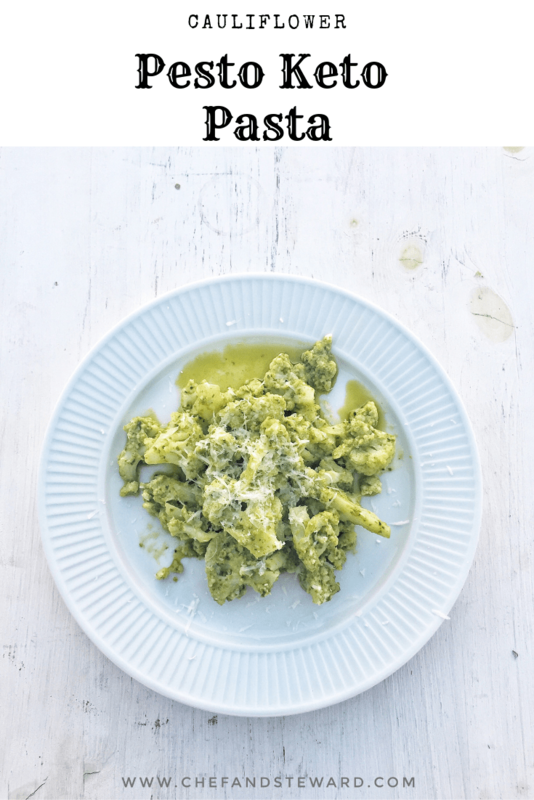 I love this idea of using the cauliflower as the “pasta”! So clever! What a yummy meal! I can’t wait to try it! This looks like a fabulous and easy meal! I’ve been avoiding gluten lately because I think it upsets my stomach and this will certainly be a great option for me to try!! 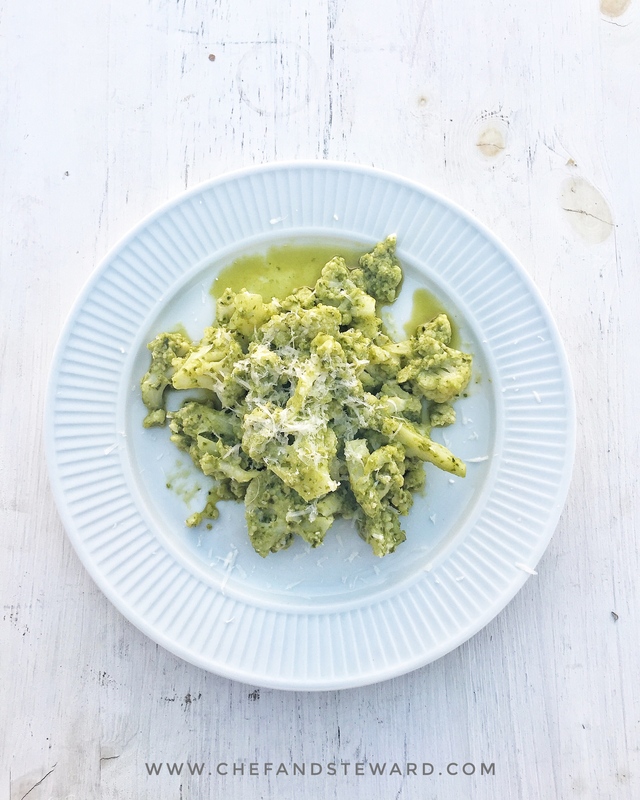 Why have I never tried adding pesto to cauliflower?! That is such an amazing idea. I just told my husband last week we’ve been eating waaaaaayyy too much pasta lol. I love Cauliflower and your recipe is amazing, I am looking for this for my diet. Thank you. I love this flavoursome combination – the garlic, the crunch, and the cheese – and 7 minutes?! I’m sold! Okay you have convinced me to try this out even though I would never eat anything like this but you made it sound pretty darn good! My mouth is watering. Can’t wait to try it!